Book Review #8….man I gotta get better at this. 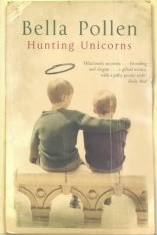 I picked up Hunting Unicorns at the Housing Works book fair for the perfect priced of .50 cents. It’s one of those annual ny events that make me kind-a like NY. Paper backs are 2 for a dollar, hard covers are a buck. It’s a small city block lined with books. And where else can you get six books for what you would spend on a grande no whip mocca. The fair was about a month ago and I’m still a little in shock. I knew nothing about Pollen nor had I ever heard of the book. When a book is priced at .50 cents, I’m feel almost obligated to judge it by its cover….I even skipped the back cover sales copy. I started the book fresh without any expectations. Now that I’ve read it, I wouldn’t spend more than a couple bucks for it. It’s a romantic comedy set in primarily in London and the near by country side. Enter Maggie: she’s an American reporter doing a story on the declining British Aristocracy. Now, focus on Robert: he’s the heir to a title and an estate in decay. The plot circles around her snooping for the facts and his attempts at hiding the family skeletons. Personally I’d can see it as the next summer romantic-comedy blockbuster staring Hugh Grant and Sandra Bullock/Drew Barrymore/Meg Ryan. You can pick your own, but he’s got to be stuff and sufficiently British and she should be a bit of a firecracker, but still age appropriate (so no Scarlet Johanson please). The story is told in alternating first person chapters. Maggie’s voice is pretty straight forward: female 25-30, American, white, middle-class, college educated. She’s kind-a funny, sufficiently intelligent, and emotionally a mess. You and I know this voice through and through. And while Pollen has made it simple for us to relate to Maggie, I felt cheated out of a good character. Maggie falls flat. She’s could be the description of a consumer for a Dove body wash and Gap jeans. The other chapters are from Robert’s dead brother’s point of view, David. David doesn’t really add much. Again, it’s a way for Pollen to cheat on a complicated character. Robert is full of good internal conflicts. He’s dealing with his brother’s death, crazy/alcoholic parents, and a financial crisis. Maggie walks in the middle of all this mess and Robert finds himself in love. For God’s sake Pollen, let the man speak for himself! He’s a mess, and I want to read it. Beyond character problems, the plot isn’t bad. It walks down that perfectly paved road set down by so many romantic-comedies, but it’s still enjoyable. The book it keeps a good pace, has plenty of twists and turns, and reaches a perfectly satisfying conclusion. I enjoyed reading it, and it only took me a couple of days. But stepping back, I won’t be reading it again nor will I pass it along to anyone, nor will I think about it after I finish this report. Maybe I’ll go get a grande no whip mocca. Previous PostPrevious I’m not the only one with pest problems!